Nixon Motor Sports: Autocross Sunday, Sunday, SUNDAY!!!!!!!!!! This weekend the NMS team will be competing with Brian driving the Fiesta with the South Carolina Region at DARLINGTON on Saturday, and then both of us on SUNDAY SUNDAY SUNDAY on the Chesapeake Bay in autocross competition with the Tidewaters Sports Car Club TSCC LINK. If you'd like to see who is registered for this event, check out the driver's page on Motorsport Registration Motorsport REG LINK. We have a cool clear day predicted for Sunday, so we're anticipating a chilly morning in the 50s and then a high around 60 degrees (Fahrenheit, not Celsius in case you were wondering). We will report later on who won the battle of North and South, Fiesta and Abarth, FIAT and FORD, and see who takes the bragging right for fastest raw time, and fastest PAX adjusted time. 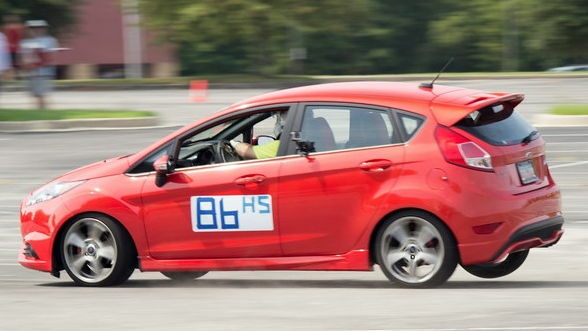 My prediction is that of course the FIAT will be fastest in both categories, AND hit fewer cones that the orange Fiesta driver from South Carolina named Brian. (I also predict that I'll find a way to cleverly turn his number sign upside down so that his car reads "SH 98" just for fun, but don't tell anyone!). Have a great weekend whatever you do, and drive safely!